It’s easy to connect with America’s Friendliest Airport® via several of your favorite social media platforms. Want to find out the latest airport news, souvenir ideas, or trip advice? Or perhaps you’re interested in historical anecdotes about Phoenix Sky Harbor International Airport? It’s easy to connect with America’s Friendliest Airport® via several of your favorite social media platforms. In fact, whether you are one of Phoenix Sky Harbor’s approximately 120,000 daily passengers, just dropping someone off or work at the airport, you can find out the latest and greatest from the airport’s channels on Twitter, Facebook, Instagram, YouTube, LinkedIn, Pinterest, and most recently, Snapchat. 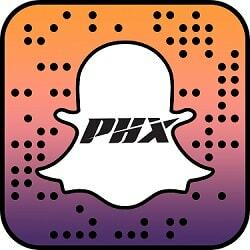 In fact, Phoenix Sky Harbor is the first airport to be on Snapchat! While it is an admirable goal but practically impossible to know everything that’s going on at the airport on any given day, these platforms will not only keep you in the loop on breaking news, retail promotions and your best parking options, but they’ll also brighten your day with surprising and intriguing stories. Viewers of the Airport’s YouTube channel were treated to hearts taking flight on June 15, 2017, from level three of Terminal 4. The airport’s news crew was on hand to record Michael making a very touching marriage proposal to his fiancé Kaylie. The couple’s family and friends were there to witness the big moment when Michael bent down on one knee and asked Kaylie to become his soulmate for life. Naturally, many passersby and visitors also looked on and cheered when Kaylie said “YES!” Not only was the event placed on the airport’s YouTube channel, it was also shared on the Airport’s other social media networks as well. Congrats to Michael and Kaylie! 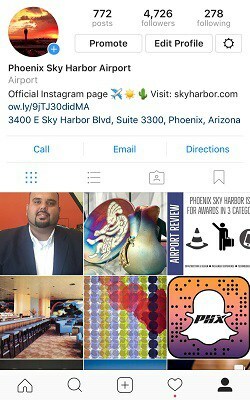 Phoenix Sky Harbor also uses its social media networks to actively engage with customers. Followers can provide feedback and ask questions, or even share cool airport photos.